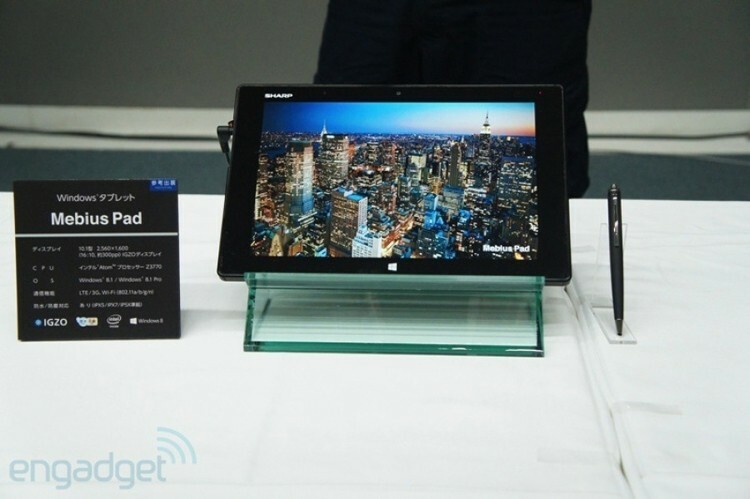 The annual trade show known as CEATEC (Combined Exhibition of Advanced Technologies) is in full swing and first out of the gate is Sharp’s Windows 8 tablet, the Mebius Pad. It may have an unusual name but there’s nothing odd about the screen: a 10.1-inch, 2,560 x 1,600 resolution IGZO display – the highest resolution Windows 8 slate yet. Engadget was on hand for the reveal and got some hands-on time with the slate. Sharp even provided onlookers with a magnifying glass to get a close-up look at the tightly-packed pixels. The publication found the display looked good in person and was surprisingly bright. The slate is also noteworthy in that it is both water and dust-proof (certifications pending for IPX5, IPX7 and IP5X) which is reportedly the latest trend for virtually any electronic device in Japan. Elsewhere, however, the Mebius Pad isn’t anything too exciting to write home about. It’s powered by Intel’s quad-core Z3370 Atom processor and will be available with LTE radios in certain regions. It’s said to be suitably thin and light with a rear shell that looks like something Sony might have recently released. With Windows 8.1 / Office and the high resolution display, it’s no surprise that Sharp will market the device to business professionals for use with spreadsheets, documents and the like. Unfortunately it’s not likely to leave Japanese soil once it launches in early 2014 but if it does, it could serve as an interesting alternative to Microsoft’s upcoming Surface 2 Pro if the price is right.